As it turns out, getting the Dallas Cowboys back in the pennant race was as easy as a drop in the bucket. 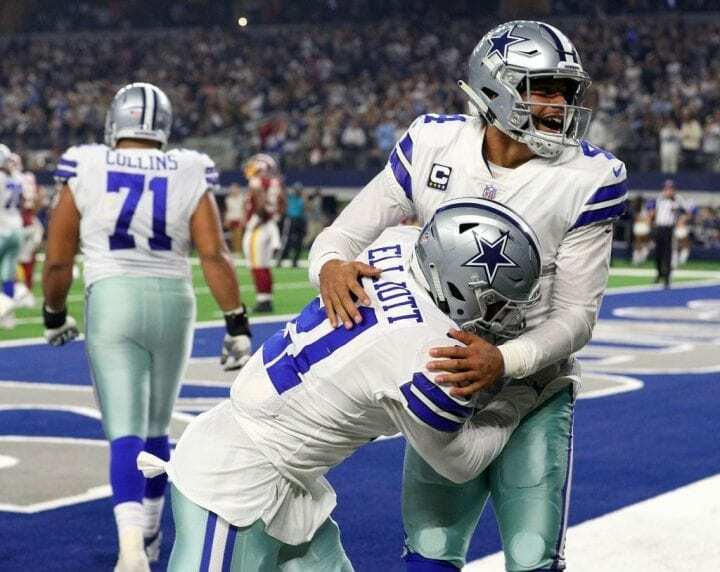 To be specific, it was $21 that Zeke Elliott deposited in the Salvation Army bucket behind the end zone when he scored a touchdown in the Cowboys’ big 31-23 win over the Washington Redskins on Thanksgiving Day. All of a sudden, the Cowboys and Redskins are tied for the lead in the NFC East at 6-5. And whomever wins Sunday’s game between the New York Giants (3-7) and Philadelphia Eagles (4-6) won’t be far behind with five games left to play. As we mentioned last week, the most important change with the Cowboys has been the addition of receiver Amari Cooper from the Oakland Raiders. A tip of the Stetson to Jerry Jones, the mercurial de facto general manager of the team he also owns. Cooper is Dez Bryant in his prime, a game-breaker on the wing whose presence has changed the dynamic of the Cowboys’ offense. No longer can defenses hone in on Elliott, knowing there wasn’t much Dak Prescott could do to counteract that. You can’t say that anymore. Did you see Cooper in the second half? He ran a fabulous route to open space for a 40-yard TD pass from Prescott. And then he used his remarkable speed to blow by his former Alabama teammate, Ha Ha Clinton-Dix, on a highlight reel 91-yard catch-and-run score. The Cowboys have won only two wildcard playoff games since 1997. And even if they win the NFC East, it’s hard to project them going much further than that, with the Rams and Saints and Bears in their path. But their three-game winning streak in a sure sign they’re headed in the right direction, which you certainly couldn’t have said before it began. On the other Dallas sideline Thursday, the Redskins were likely wondering if they’d hit the end of the road. They have watched their two-game lead over the Cowboys disappear and their starting QB, Alex Smith, fitted for a cast to protect his surgically repaired broken leg. It will be up to Colt McCoy to figure things out and rally this team and, frankly, he did not play poorly in his first real action since 2015 – the last time he’d thrown an NFL pass. But eventually, he was bothered by the Cowboys defense, made some mistakes, and the task ahead suddenly became clear. While not a superstar, Smith’s experience and instinct made him a perfect match for the Jay Gruden’s ball-control offense. Without him, the Redskins may be more inclined to focus even more on running back Adrian Peterson and that might be too much to ask from the veteran. When you mix in the incessant injuries that have already short-circuited them, particularly along the offensive line, you have to wonder if they have the second wind to fight back now that the Cowboys have asserted themselves. Chicago had its own problems on Thursday. 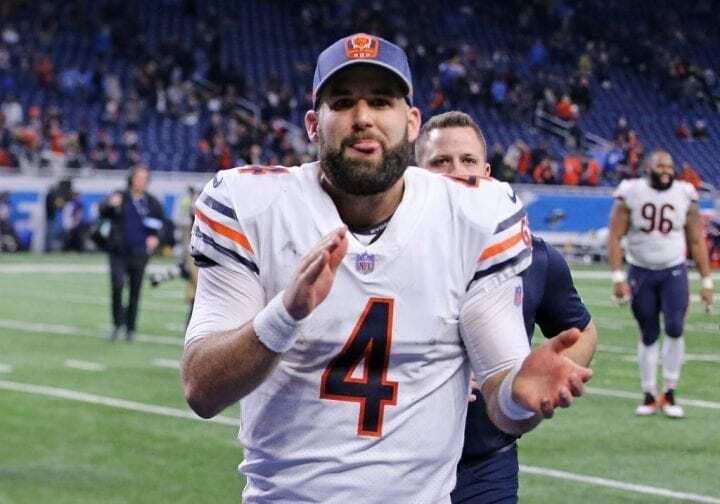 Faced with the absence of Mitchell Trubisky, who was out with a shoulder injury, coach Matt Nagy handed the offense to Chase Daniel in Detroit and hoped for the best. In only his third career start, Daniel was 27-of-37 for 230 yards and two TDs and did not throw an interception in their 23-16 win. Unlike McCoy, who has hardly had time to practice, Daniel came in with more than a fundamental handle on Nagy’s offense and he flawlessly moved the ball to eight receivers. And he even added an 8-yard reception. The Bears (8-3) have won five straight and are in control of the NFC North, no matter who wins Sunday Night’s game between Green Bay and Minnesota. And now they are confident Daniel can handle things if their projection is correct and Trubisky can’t play next week against the Giants. As usual, the Bears defense was there to support Daniel. The pressured Matthew Stafford, sacking him twice. Even without Kerryon Johnson and Marvin Jones. Jr., the Lions outgained the Bears by 69 yards. But the defense made Detroit cough it up twice when it mattered in the fourth quarter. The biggest play was Eddie Jackson’s 41-yard pick six with the game tied 17-17. The unstoppable New Orleans offense pushed the team to its 10th straight win and made you wonder, once again, how in the world it ever began the season losing to Tampa Bay. And their revived defense, which allowed the Falcons 37 points in their first meeting in Week 2, keeps getting better. The Saints have allowed only 38 points in their last three games. On Thursday, they sacked Matt Ryan a season-high six times and hit him 13 times. It recovered three fumbles and made an interception. If their defensive play proves no aberration, you might consider the Saints (10-1) favorites to win the NFC, especially if they can hold onto home field. With the exception of the Bears, no other playoff team seems to have the capability to slow down the Rams. But only the Saints can simultaneously outscore them. But back to their offense: The talk recently has been about the lack of receiving options Drew Brees has aside from Alvin Kamara and Michael Thomas. They signed Bryant, but then his injured his Achilles. They signed Brandon Marshall, but he couldn’t play Thursday. And Tre’Quan Smith, who celebrated his coming-out party against the Eagles (10 catches, 157 yards), was inactive with a foot injury. Undaunted, Brees (174 yards) threw TD passes to Austin Carr, Keith Kirkwood, Tommylee Lewis and tight end Dan Arnold, all undrafted free agents. According to ESPN, the Saints became the first team since the 1984 Steelers to have a quartet all score their first or second career TDs in the same game. That means Brees has now thrown 29 TD passes this season and at least one to 13 different players, tying Ryan’s league record set in 2016. Problem solved. Next up? The Cowboys on Thursday Night. How can the loser of Sunday’s Packers-Vikings game having any legitimate chance of catching the Bears in the NFC North. It’s equally hard to imagine Mike McCarthy coaching the 2019 Packers, if they do. The Packers have already lost three of their last four and one more defeat would drop them two gamed behind the Vikings, who are barely holding on the second NFC wildcard. Green Bay’s defense, like everyone else in the league, will have a major problem contending with receivers Stefon Diggs and Adam Thielen. And its run defense is just about the worst in the league. How bad are things for the Packers? Aaron Rodgers brother, Jordan, blasted the QB for being disingenuous after donating $1 million to victims of California’s Camp Fire. Apparently, Aaron Rodgers, according to his brother, didn’t bother to check in with his own mother as she was trying to flee the flames. Then again, Vikings coach Mike Zimmer also threw many of his players under a Greyhound after their loss to the Bears last Sunday. Kirk Cousins threw for two interceptions for the first time this season and had a 76.5 passer rating in the 25-20 loss. Zimmer claimed they either weren’t listening to him or couldn’t care less about what he was saying.